After the star-studded Timberwolves game Thursday night thanks to the Super Bowl with courtside appearances from such names as Bill Belichick, Floyd Mayweather, Antonio Brown and Gucci Mane, the Wild was poised for more celebrity spotting in the crowd at Xcel Energy Center on Friday night. Well, apparently professional hockey in 10-degree weather doesn’t have quite the same draw as the NBA because there were no reports of luminary sightings. But that didn’t stop the Wild from putting on a show in a 5-2 defeat of the dominant expansion franchise Vegas Golden Knights. And 19,057 fans still showed up despite the lack of star power. Wild coach Bruce Boudreau said he wouldn’t call the Super Bowl “the biggest game on earth,” but rather “the most-watched game on earth.” He corrected that the biggest game in his mind was actually this next one for the Wild because of that standard sports cliche. The Wild must have taken that too heart, though, as it couldn’t have started much better than it did Friday, as it outshot Vegas 19-8 in the first period. On the second of pretty much back-to-back power plays about halfway through the period, center Eric Staal netted a goal after a spot-on pass from defenseman Mike Reilly, back for the first time in six games after being a healthy scratch and possibly looking to make a splash with a possible trade on the way. Defenseman Matt Dumba also assisted. That makes seven-consecutive games with a power-play score for the Wild. Vegas goaltender Malcolm Subban was unable to make the save as Wild center Eric Staal put the puck in past him in the first period. 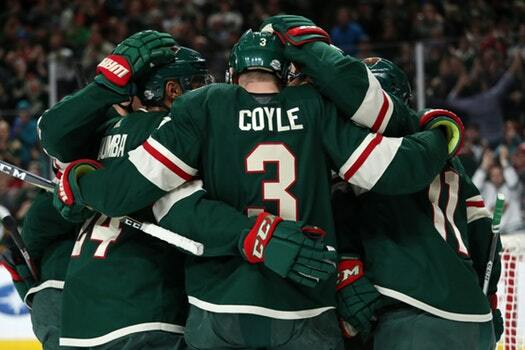 Then about five minutes later, forward Charlie Coyle netted a quick shot off a faceoff, with assist from defenseman Jonas Brodin and forward Joel Eriksson Ek. The second period didn’t improve much for Vegas, which was coming off the high of breaking the expansion team record for wins in an overtime result at Winnipeg on Thursday. Winger Tyler Ennis scored another for the Wild off an assist from Brodin at 1:11. Former Wild forward Erik Haula took one back about five minutes later on Vegas’ first power play with assists from defenseman Colin Miller and winger David Perron. Wild defenseman Jared Spurgeon scored another power-play goal for the Wild at 16:08, though, with defenseman Ryan Suter and Staal assisting. Vegas challenged goaltender interference on Zach Parise after Spurgeon’s found its way through traffic, but the goal stood. And in the end, Vegas managed only five shots to the Wild’s 11. Dumba and Vegas forward Ryan Carpenter added some intrigue as the second period winded down, dropping the gloves for a brief wrestling match. St. Cloud native Nate Schmidt continued the Minnesota connection goals, scoring on the power play at 12:38 in the third period with assists from Perron and Haula. Staal grabbed an awarded goal with Brodin and Dumba nabbing the assists toward the end of the game. The Wild ended up handing the record-setting expansion team its biggest loss since a 7-4 result at Winnipeg on Dec. 1. But that doesn’t do too much to diminish Vegas’ accomplishments, considering the team is still unexpectedly second in the league after Tampa Bay. And apparently that victorious mentality harkens to one of the Super Bowl contenders on Sunday at U.S. Bank Stadium. 0 Response to "Wild extends home point streak to 10 games with 5-2 win over Vegas"